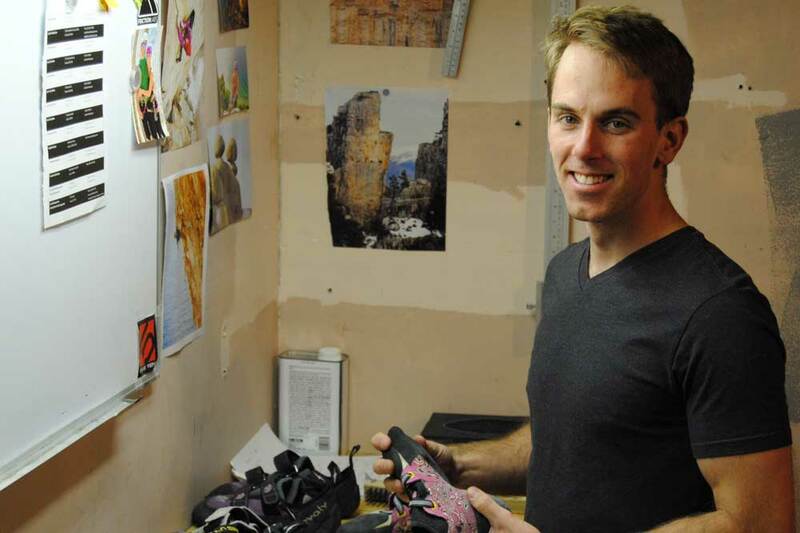 With its custom-made presses and lasts, Ontario Resoles can help breathe new life into old climbing shoes. We caught up with Ontario Resoles owner Mike Doody and discussed climbing rubber, minimizing environmental impact and growing up across from Old Baldy. Congratulations on launching Ontario Resoles. How long have you been resoling shoes? Ontario Resoles: Thanks! I've been resoling shoes on a small scale for years. Over the past year I've been quietly duplicating my machinery, perfecting the process and getting ready for a larger volume of shoes as I launch Ontario Resoles. So what prompted you to move from resoling as a hobby to doing this as a business? Ontario Resoles: I don't feel like there was a eureka moment. The reaction I got from climbers who saw my work was encouraging and the idea of going full-scale was always in my mind. I get great satisfaction out of crafting something real and resoling climbing shoes allows me to do that within a community that I am already involved in as a climber. So, I've always wanted to expand this into a business; it was simply a question of how and when. Climbing in Ontario is big and growing fast. There is a definite need for quality resoling. I reached a point where I could not ignore the opportunity any longer. Why should folks even bother to resole their shoes? Ontario Resoles: There are a few reasons. Resoling a pair shoes is much cheaper than buying a new pair. 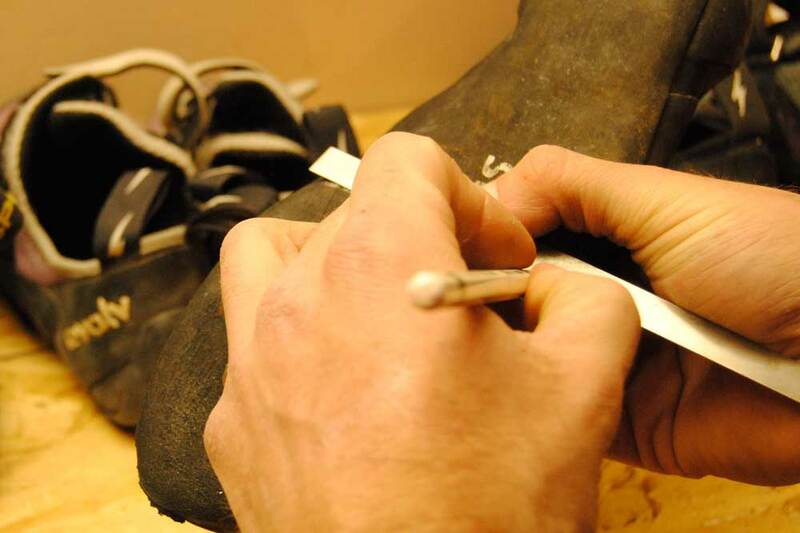 Opting for a resole will also maintain that perfect broken-in fit that you spent painful hours achieving. Unless a pair of shoes has really been abused, the upper still has plenty of life when the soles are worn out. Lastly, if you are looking for ways to reduce your environmental impact, you will likely agree that a resole is a greener option than a new pair of shoes. You’re coming from a mechanical engineering background. How do you think this benefits you as a climbing shoe resoler? Ontario Resoles: I think it has been hugely beneficial. It has framed the way I approach my resoling process. I've designed much of our equipment and machinery myself. Our presses, for example, are completely custom made and are designed to apply optimal pressure when glueing the sole to the shoe to achieve the best possible bond. One of the unique things we do is maintain the concave cup that you will find on soles of more aggressive shoes. We can even add this cup to shoes that have never had it. This process is only possible with the combination of our custom presses and our custom lasts. Even the glue that we use was chosen after a series of controlled adhesion tests between different brands using climbing sole rubber. 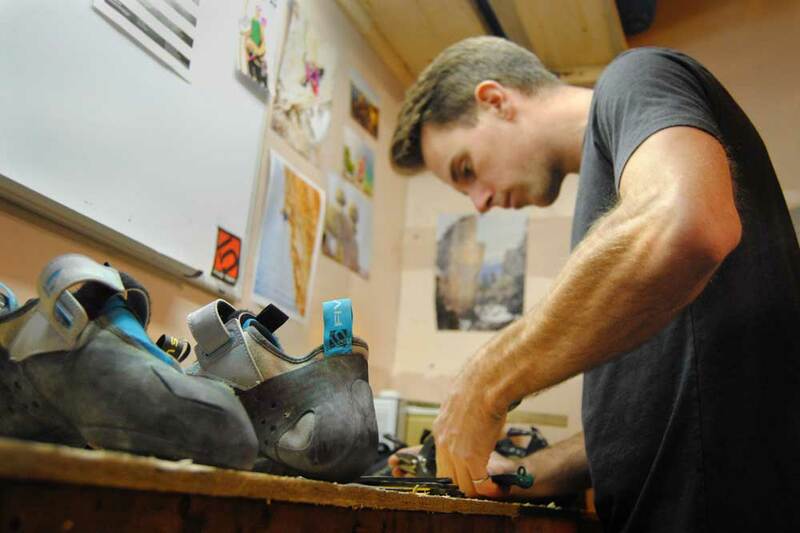 Climbing shoes have become incredibly sophisticated with complex lasting and tensioning. Are you able to resole these shoes? Ontario Resoles: Yes, we are. 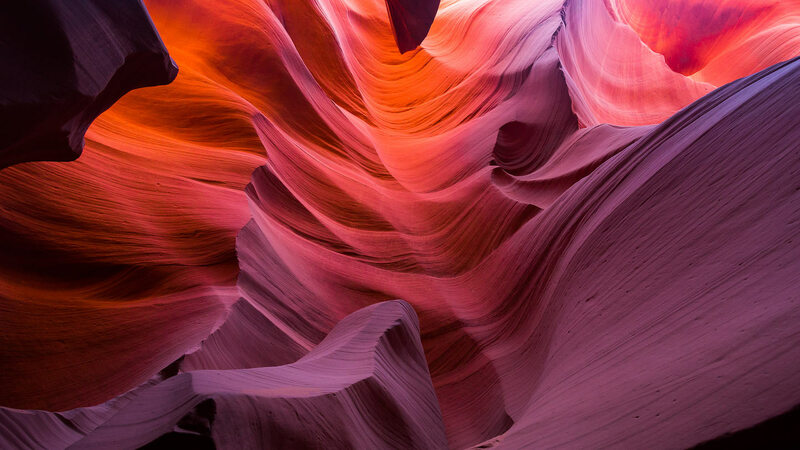 Most of the recent advancements in climbing shoe technology involve the structure of the shoe itself – the upper, the midsole, and the architecture of the tensioning bands. When we work with these newer shoes, the differences between brands and designs in how the shoe flexes and twists are noticeable. We take great care not to affect the structure of the shoe and to maintain the subtle qualities that contribute to the stiffness, sensitivity and fit the climber will experience. Because of our high quality standards, we can't yet offer resoles for edgeless shoes like the La Sportiva Futura or Genius. Once we perfect our technique, we intend to add them to our offerings too. What are some of the available rubber options? Ontario Resoles: Currently, we use Five Ten for our rand material as well as our soles. Their Stealth C4 is a tried-and-true rubber compound that offers good durability with lots of friction. We have the C4 in 4.2 mm and 3.5 mm thickness. Most shoes come with a 4.2 mm sole, but some of the more sensitive shoes come with 3.5 mm. The customer can choose the thickness they desire, or have us decide based on their shoe (we go by whatever the shoe had originally). As we grow, we will offer even more options for those who want an extremely soft and sticky rubber at the expense of reduced durability. Ok, a small break from all the tech-talk. How did you get into climbing? Ontario Resoles: My mother used to live in Kimberley, Ontario. Her front porch had a clear view of the face of Old Baldy and I would often watch the climbers. My girlfriend and I used to hike the trails on top of the cliffs and would often run into climbers emerging from the approach trail. We've always been outdoor adventurers and were intrigued by the idea of climbing. At some point we decided we should try it ourselves. We bought enough gear and did enough research to start top-roping at Rattlesnake Point. From there it was a love affair. The TR rack turned into a sport rack, Rattlesnake turned into Lion's Head and vacations turned into climbing trips all over the world. And now back to our regular programming. Climbers usually think about resoling only after they've blown a hole in the rand rubber or totally chewed up the sole. Is this the best time to consider a resole or should folks be a bit more proactive? Ontario Resoles: The majority of resoles we do include a rand repair, and those repairs come out great. But you're absolutely right. Folks should be more proactive. The ideal time for a resole is long before you can cut your toe nails without taking your climbing shoes off. We've got some photos on our site that explain this. If you're wearing a hole in the rand, your shoes haven't been performing like they should for a long time. It’s the sharp edge of a climbing shoe that allows full contact with small footholds. As the sole wears and becomes rounded, the contact area on small edges is reduced and it becomes harder to stick that heinous foothold. It is worth noting as well that resoling before you need rand repair is the cheaper option – short and long term. 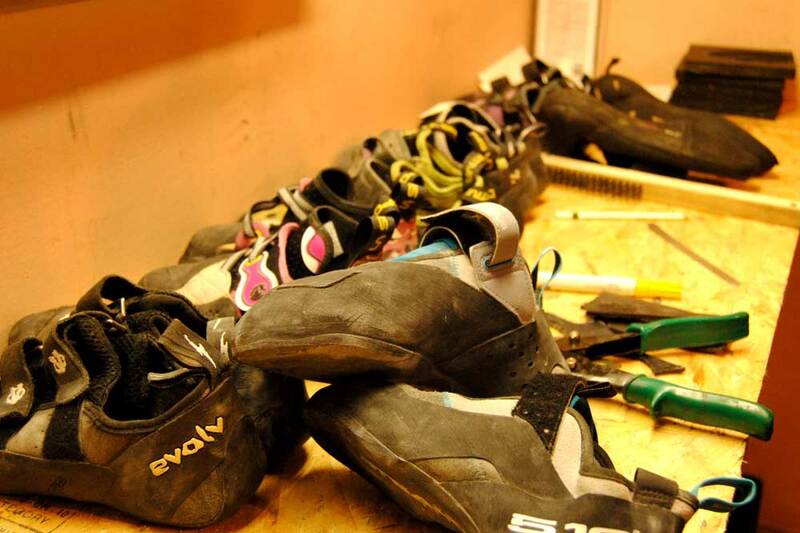 Ok, what’s the worst and best thing about being a climbing shoe resoler? Ontario Resoles: The best? Being immersed in an industry that I am passionate about and meeting like-minded people who are just as psyched as I am about the Ontario climbing scene. As for the worst... the smell. So how do folks get their shoes resoled by Ontario Resoles? Ontario Resoles: We have a mail-in option as well as a growing number of convenient drop box locations that will save customers shipping costs. The process for both of these options is simple and is outlined on our website. There is currently a drop box at Grand River Rocks in Kitchener and we will be delivering one to Gravity in Hamilton the first week of February. We have others in the works, so keep an eye on our social media for details.